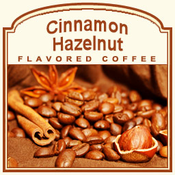 We have combined the enticing buttery flavor of hazelnut oils and extracts and the zesty kick of cinnamon with our hand-blended, Arabica coffee beans to create the Cinnamon Hazelnut flavored coffee. This unique fusion of ingredients and flavor creates an exceptional taste and enticing aroma that is absolutely irresistible. Cinnamon and hazelnut flavors stand great alone in coffee and are considered flavor classics. We have blended these two flavors together to create a new classic. With the sweet spice of cinnamon and the nutty sweetness of hazelnut, we are sure you will fall in love with our Cinnamon Hazelnut flavored coffee.